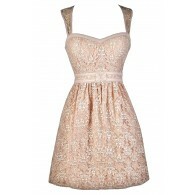 This lovely dress with lace insets is one part girly and romantic and one part laid-back boho chic. The Monica Lace Waistband High Low Designer Dress comes in two great color options for you to choose from. 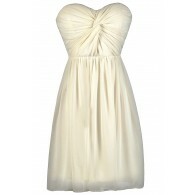 It is made of 100% cotton and has a rounded neckline, adjustable spaghetti straps, and stylish high low cut. The best part of this dress is the sheer lace detail at the neckline, waistband, and bottom hem of the skirt that adds an ethereal airiness to this style. Fabric ruching at the back of this dress expands to fit and an invisible side zipper completes this hippie chic dress. The Monica Lace Inset High Low DesignerDress could be worn with flat sandals for a casual beachy day look—or you could dress it up with wedges or heels. This is a great dress to wear to a festival or pack on vacation. Details: Lined at bust and below the waist. Adjustable spaghetti straps. Hidden side zipper. 100% cotton. Contrast: 100% polyester. Lining: 100% polyester. Hand wash cold. Do not bleach. Lay flat to dry. Small measurements: Length from top of bust to hemline: 32-41”. Bust: 32”. 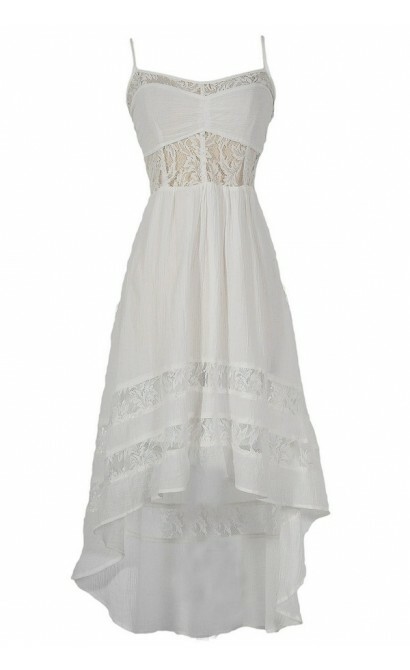 You have added Monica Lace Inset High Low Designer Dress in White into Wishlist. You have added Monica Lace Inset High Low Designer Dress in White for Stock Notification. 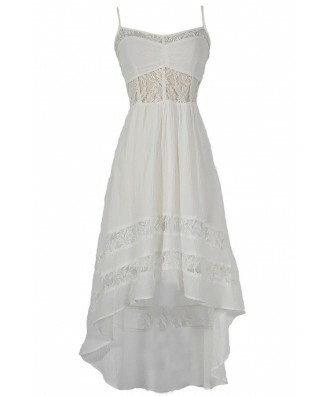 You have set Monica Lace Inset High Low Designer Dress in White as a loved product. 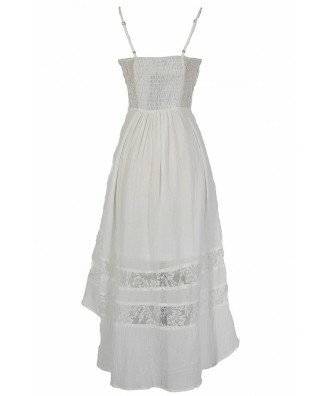 You have removed Monica Lace Inset High Low Designer Dress in White as a loved product.